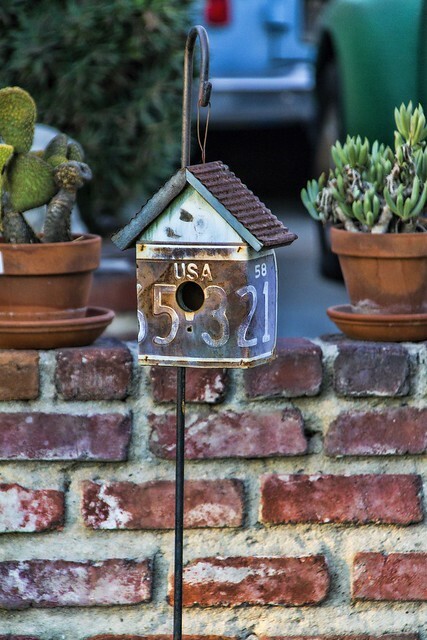 Even birds need a place to call home. I've always been a fan of fun, eclectic birdhouses. I seem to find new ones in our neighborhood often. I particularly liked that this one was made of a repurposed license plate. In Eurasia, the Turkish culture has evidence of birdhouses from before the Ottoman period of the 1500s. Small and simple in design in the beginning, they progressed to ornate structures. The houses were built as a refuge for the lonely birds of the sky and to protect them from the elements of nature. Going back to the 15th and 16th century, birdhouses in the European countries of Belgium and Holland were used to trap birds for food. The eggs and chicks would be gathered from the nests built in the house. The nests were built from baskets, wood and clay; clay became the preferred material for its durability. In America, Native Americans built simple birdhouses out of birch bark and hollowed-out gourds. They were designed to not only shelter the birds from storms, but also to help the birds breed and multiply. The Native Americans passed this tradition on to the English and German immigrants. "The bird doesn't sing because it has an answer, it sings because it has a song."